Hello all, I’m back today with another Meet the Blogger post, it’s been a while! I’m here today to introduce you to Shanah @ Bionic Book Worm! Shanah is a hard working blogger and I really enjoy reading her posts! She does her own memes and a blogger recognition post which I think is really respectful and lovely! So, without further ado, let’s meet Shanah! I am a mom of two kids, wife of an amazing husband, and owner of two businesses. My life is crazy and full of chaos so I read to escape it all! I learned how to be a bookworm from my mom and reading is all I ever really think about! Don’t forget to follow Shanah on all her social medias! When did you start your blog and what made you decide to start blogging? I started my blog in January of this year. I’ve always been a big book lover and it was my resolution to do something for myself. So I figured what better than talking about books!! I was in a massive reading slump a few years ago and never knew what books to pick up. There were always so many to choose from and I was always picking the wrong ones! So I found You Tube and book blogs and it was through those reviews that I found books I absolutely adored! I wanted to blog about my own reviews and thoughts in hopes that others would be able to find something they loved. This has been the greatest decision I’ve ever made!! What is your most recent 5 star read and why did you love it so much? 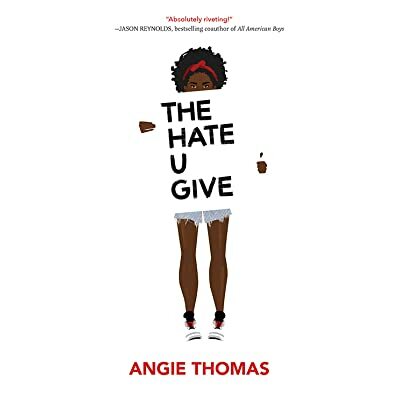 My last 5 star read was The Hate You Give by Angie Thomas and there was honestly so much to love! The main character Starr was wonderful. She was so real in her daily struggles and her fear of standing up against people/organizations that she was unsure if they would take the proper course of action. Not only that but she had the fear of backlash if she told the truth. I also LOVED the fact that she had parents! Sounds weird but let’s be honest – supportive and loving parents in books is hard to come by. But it was the message itself that was perfect. It was relevant to current social injustices and the hurdles people face every day. I didn’t want to read it at first because of the hype, but this one went above and beyond the hype!! Is there any genre you’re sure you’d never be interested in reading? What is it & why? I read pretty much any and everything. But chick lit is one I never go for. I just find that they are full of so much drama and petty problems that I can’t relate to. I have enough drama/problems to deal with in my own life – I don’t need to read about it too!! I also find girls hard to relate to. Almost all my friends were boys. So that probably has something to do with my lack of enjoyment for these books. Are there any really popular books you don’t like? Being that most of the books I read are YA, popular books that get talked about are contemporary. It’s not that I don’t like them, it’s that I’m a little too old to enjoy them! It’s awful to say but it’s true. Most of the content surrounds problems in high school and I’ve been out of high school for longer than I care to admit. So I find that I can’t put myself on the same emotional level to enjoy them as much as I could. But there are still a few that I really enjoy!! What’s your opinion on secondhand books? Love them!!! If I can find deals on books that I’m interested in then I’m all over it like a dirty shirt! Books are expensive in Canada sometimes and I have two kids that are always begging for money, so if I can find a deal it makes me smile! They have to be in good condition though. No rips or tears and no food stains – that’s just gross! What are some of your favourite book covers? Do you have any bookish pet peeves? Oh do I!!!!! Cover changes, movie adaptation covers, stickers on covers, having to wait so long for a book to be released in paperback, covers with faces on them – the list could go on and on!! What book or series could you read over and over again without growing tired of it? Harry Potter! Always (ha! See what I did there?) I’ve read the series in its entirety at least three times and I’ve read the first book itself 10 or more times. I actually plan to do a series reread next year and can’t wait! What’s the best piece of advice you would give to newbie bloggers? If you could meet any author, dead or alive, who would you want to meet? Hard question! I would have to say Sarah J Maas! I just love her to pieces! I’ve watched so many author talks and interviews and she is the type of person I could get along with very well. She seems so nerdy, funny, and passionate about all things. Not to mention I love all of her books to pieces!!! So there we have it! That’s Shanah! I hope you’ve all enjoyed getting to know her and ill go over to her blog and follow her! I hope you’ve all enjoyed this post, and be sure to keep an eye for a few more of these Meet the Blogger posts coming soon! Awww, so glad you featured Shanah! Such a fun post. Loving all the blogger love here! Great post. I love The Bionic Bookworm, too.